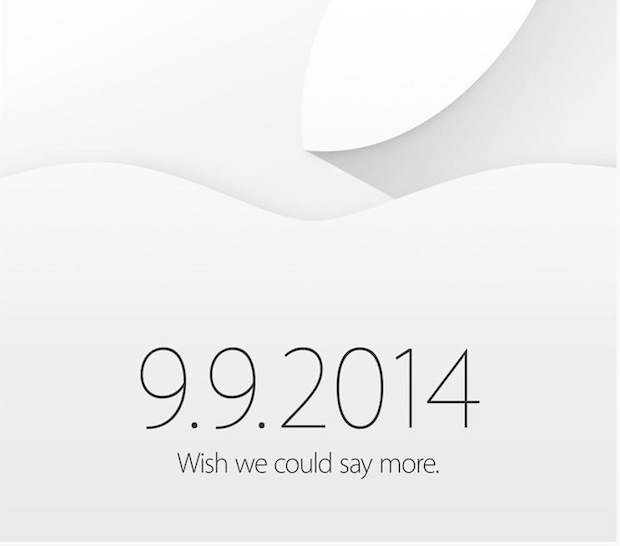 Apple has sent out press invitations to an event on September 9, 2014. The invite, shown above courtesy of Wall Street Journal, is simple and cryptic, stating simply “Wish we could say more” and displaying the date “9.9.2014”. The iPhone 6 is expected to be the star of the show, being offered in two sizes with 4.7″ and 5.5″ displays. A recent report suggested that Apple will unveil the wearable device commonly called iWatch at the 9/9 event as well. Both devices are said to make use of several new iOS 8 features, including HomeKit, a home automation suite, and HealthKit, a series of health tracking orientated features. September 9 coincides with what Re/Code, Wall Street Journal, and Bloomberg reported several weeks ago as the launch date of iPhone 6. It’s probable that iOS 8 and OS X Yosemite will have public shipping dates announced at the event as well. There are plenty of rumors surrounding the iPhone 6, but what’s most likely to be included with the new device is a new thinner redesigned enclosure, larger and more durable screens, an improved camera, and a faster A8 processor. Rumors surrounding the iWatch suggest it will monitor the wearers health and fitness activity, and perhaps augment other Apple services. The September 9 event will be held at the Flint Center for the Performing Arts, a large venue located at De Anza Community College, not far from the Cupertino campus of Apple Inc. The company has history at the venue, as the Flint Center is where Steve Jobs debuted the original Mac in 1984. I hope they do pre-orders that Friday, I need the iPhone 6 pronto, my iPhone 5 is barely hanging on! Has the event time not been announced? I noticed the WSJ didn’t mention it in the article. Do you know? 9AM or 10AM PST is typical for Apple launches. Hopefully it will be live broadcasted by Apple! Please have pre-orders for Verizon customers. I need a new iPhone really bad because my screen is cracked! I refused to get a new because I wanted an iPhone with a larger screen! Gruber now saying there will be NFC or something like a payments system on iPhone 6 that can hold your credit card information for use at retailers. We are waiting for Apple’s new inventions.we hope for extra features.